After losing her job, making out with her soon-to-be former boss, and finding out that her daughter plans to spend Thanksgiving with her boyfriend, Claudia Larson, played by Holly Hunter, faces spending the holiday with her family. The holidays… so many emotions from joy to pain, anticipation to mortification, elation to disappointment. My advice is to focus on what you can control. There is no point in trying to change family members, even if you’re the greatest personal development coach on the planet. What you can control is how you respond to your family. If you want to eat a piece of pumpkin pie, then do, but don’t beat yourself up after or you defeat the pleasure it brought you in the moment. While work slows down for some people this time of years, for others it’s the busiest time of all. If you’re the later, be sure to plan your next 60 days NOW. Something else you can focus on is who you are being in the world. I find the holidays to be the most glorious time of the year seeing the decorations, hearing Christmas songs, smelling pumpkin spice in every Trader Joes and Williams Sonoma I walk into… I want to celebrate every day! Now you may be thinking that you pay it forward out of the goodness of your heart not to toot your own horn, but I’m going to ask you to share one experience anyway, here’s why… your story may inspire someone the way I was inspired. I heard a story many years back when the Drew Carey Show was doing so well that The Emmys rewarded them handsomely. Drew Carey decided to reward himself with a new Mazda Miata. I believe he earned it But when Drew drove to work on Monday, his spot was taken up by a brand new Porsche. He discovered that the producers thought he should be rewarded as well. Drew was blown away with gratitude. He walked on set and questioned, “Who has the oldest beat up car on the crew?” Someone said that one guy didn’t even have a car he rode a beat-up bike. Drew found that guy and handed him the keys to his Miata. That story stuck with me. Drew’s generosity inspired me. Years later, I owned an Acura Integra. It was in good shape, but it was a stick shift and driving in Los Angeles traffic, I was ready for something new. The day I leased my new car, I walked into my office at the Cinematographers Guild and handed my keys to the Integra to a guy named Don. If another employee couldn’t give Don a ride to work, he had to take the bus. It was an emotional moment for both of us, one I treasure. 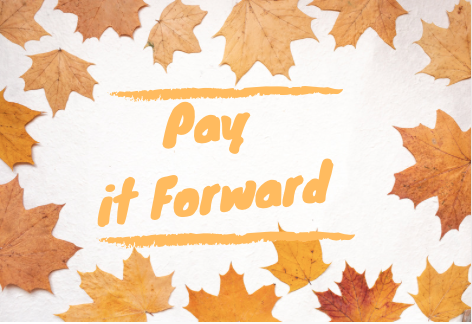 So please, share your story of paying it forward in the comments below with the hopes of inspiring others to do acts of kindness and generosity this holiday season. 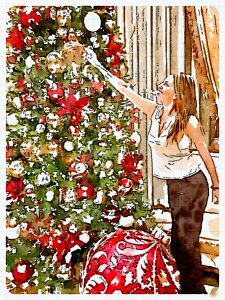 While Claudia was driven bonkers by her family, when she began to focus on the possibility of a new romance with her brother’s friend, suddenly she had a little fa la la la la in her step and attitude. Want More? More Clients, More Business, More Money, More Success? Check out my Insider Circle HERE. You’ll receive access to our private Facebook group, LIVE Q&A webinars with me, a monthly business webinar along with the archived business webinar topics like Maximizing the Holidays an 8 Week Plan for Sharing and Growing Your Business, Lead Generators, Branding Your Business. PS… if you’re hesitating on this great opportunity that gives you direct access to me and is tailored to your business needs, maybe, you need to shift your mindset. 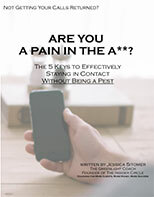 I have a free webinar on the 5 Mindsets for Success that you can access HERE.